stepping out in front of me. 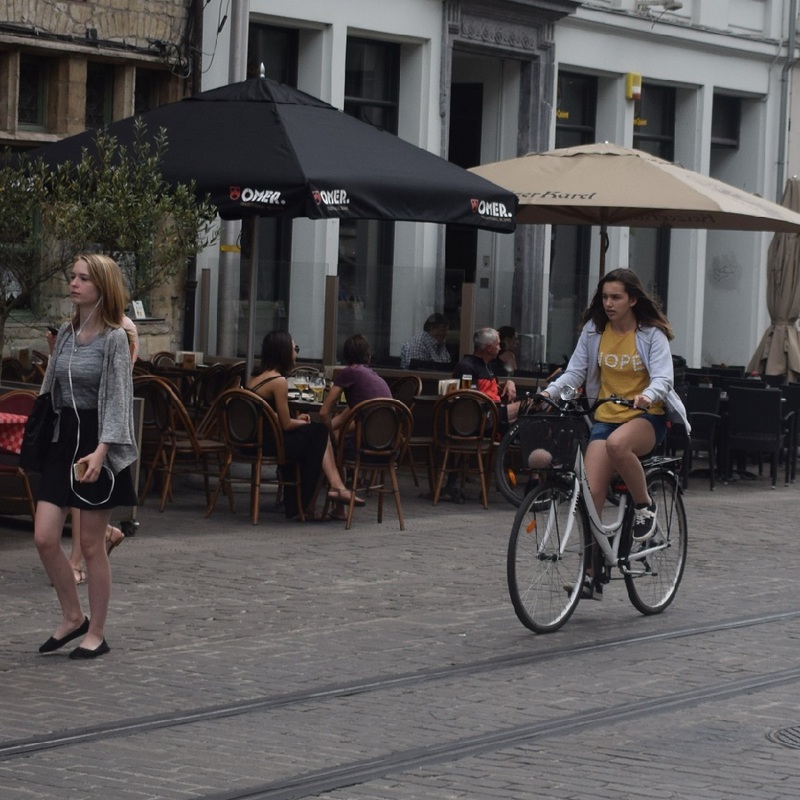 As bikes are an important part of Amsterdam, I felt as though I was a part of the city. 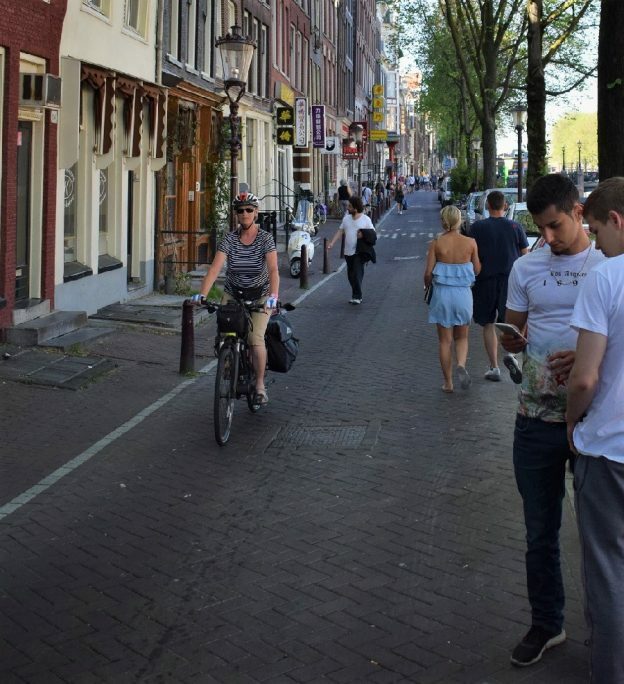 Amsterdam is a bike-friendly place to ride, if? Pedaling into one of Amsterdam’s parks over the canal. 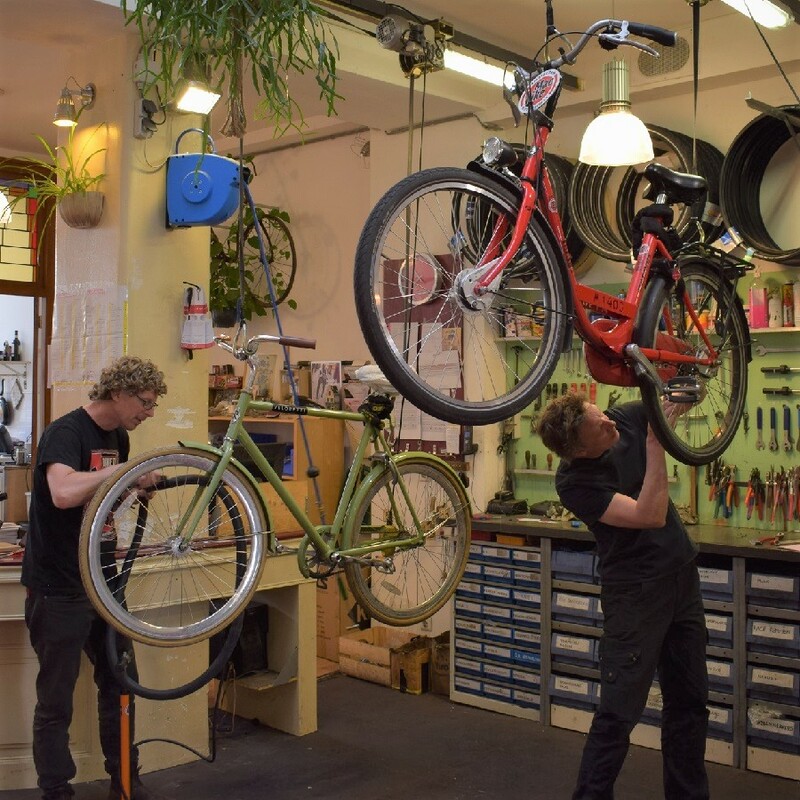 One of the bike rental shops working on their fleet of bikes. Looking on the web for a rental bike, there seemed to be an ample supply of bikes available around the city. I assumed that I could wait until midmorning to go out and rent a bike for the next couple days, my mistake. Even though it was a midweek day, the best bikes in two shops I stopped at had most of their fleet checked-out. Only a few of their older, well used, bikes remained. Luckily a bike was being returned that fit me well. So I was on my way, taking with me a valuable lesson in renting bikes in a popular tourist area. Unless you can reserve a bike ahead of time, get there early to get a pick of their best. Handy bike maps are available, free, at most hotels and bike rental shops. With a couple of versions in my pocket for occasional review, they worked well for me. Pedaling the streets along the canals, there is way too much for the eye to see, from gorgeous architecture, charming flower boxes, crowded cafés, etc. So forget your iPod, your ride will have its own soundtrack. Some of the sounds you may hear include the whirring of a canal boat’s motor, the peal of church chimes, the hum of motor scooters as they zip up behind you triggering your brain to move over to the right to let them by and the tinkle of a bike’s bell, maybe yours? I found that my right hand stayed pretty close to the bell on the bike’s handlebar, warning sightseers to move out of the bike lane. The City Center is packed full designated bicycle parking lots. helpful in finding my way back to my hotel. 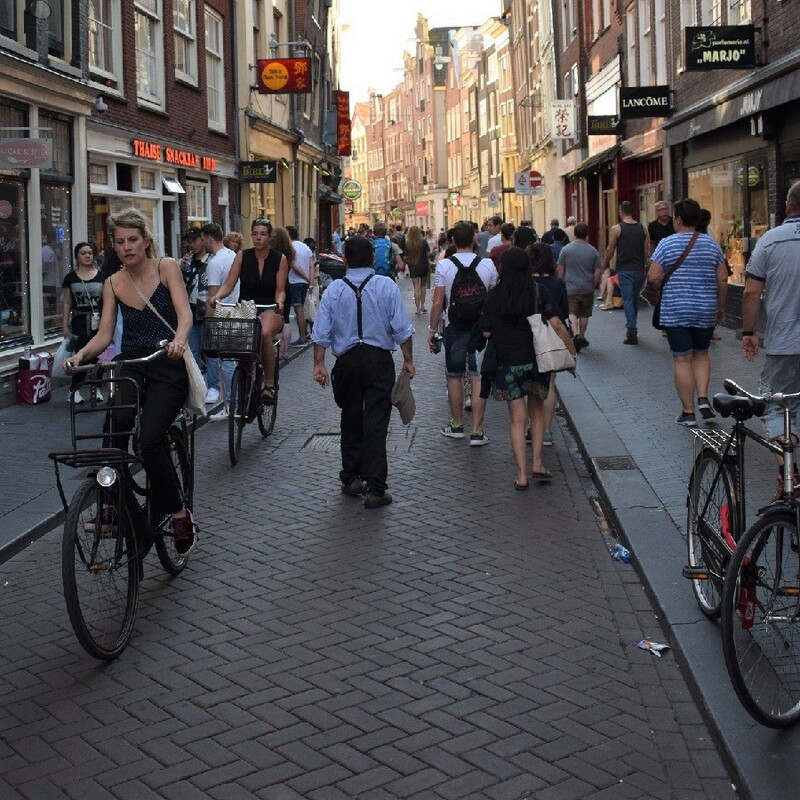 In the first few hours, I rode through Amsterdam’s finest sections including the Jordaan District which could be referred to as the heart of the city. Then I rode past the Anne Frank House where I had a tour scheduled the following day. Next, I passed the house of Rembrandt and then by the awesome architecture of the Rijksmuseum. Finding my way back, I wandered through China Town and then the Red Light District before meeting friends for dinner. 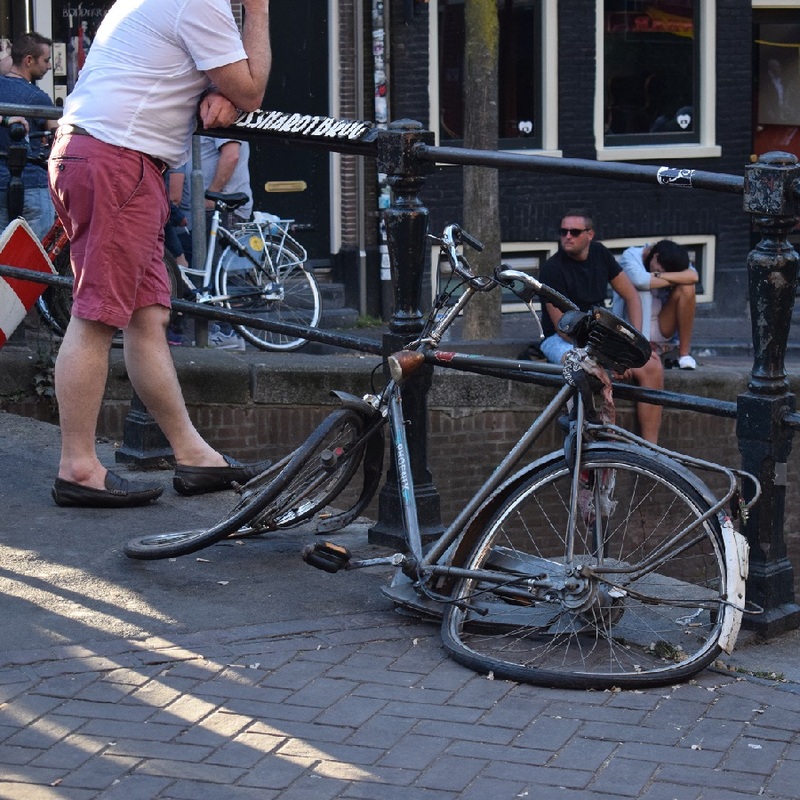 Locking your bike to a bridge in Amsterdam can be a hazard. 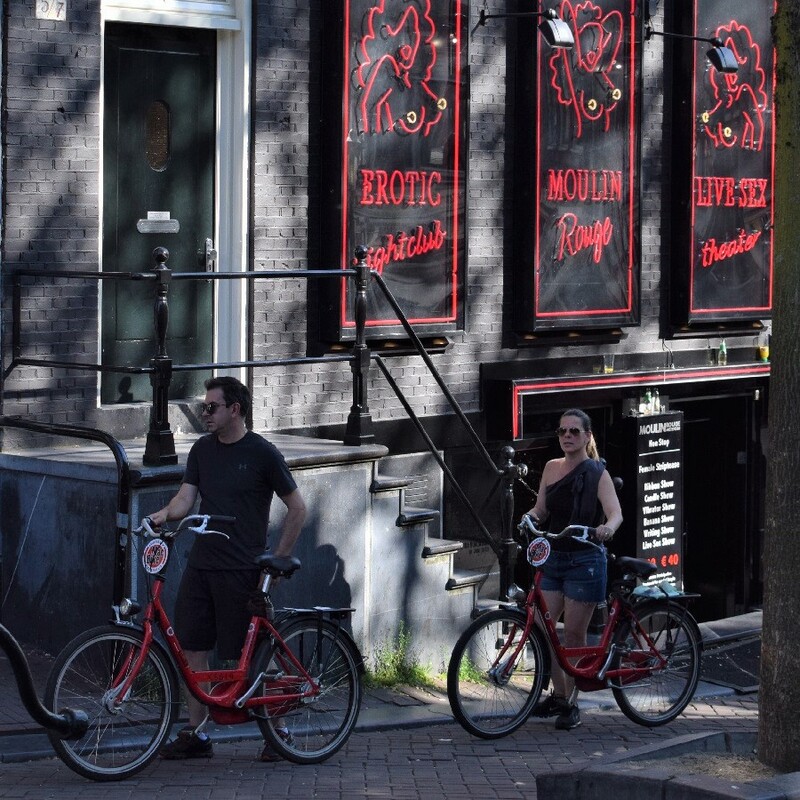 In just a few hours riding my bike around Amsterdam my confidence was high … and so was my thirst. Meeting friends for a beer, several who just arrived in town for the bike/barge cruise, there was some envy as I pulled up on my rental bike. 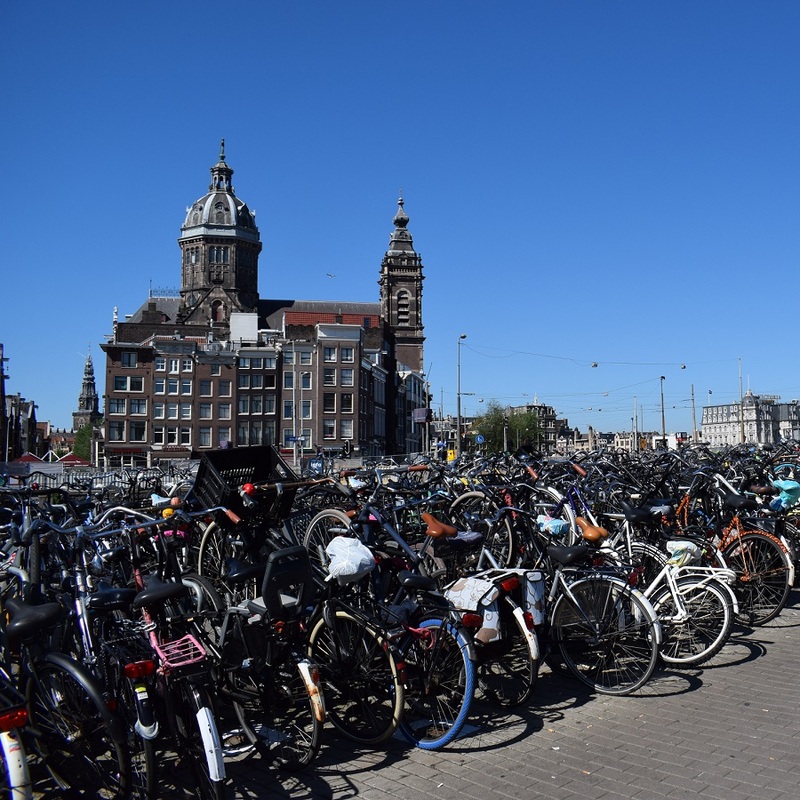 Several asked as I walked in with my helmet still on, “where have you been?” I replied with an accomplished grin, “I’ve biked all over town!” As I shared with them my first day’s adventures in Amsterdam touring the city by bike. With a loose itinerary, only the Anne Frank Tour scheduled mid-afternoon and dinner plans in the evening, I was off. First, I found myself at Amsterdam’s bustling flower market, where crowds come to buy or just admire a wide array of flowers. After enjoying a cup of coffee and the fragrance of the market, I pedaled across a series of canals to one of the city’s street markets. Here, I found another Dutch treat, a herring stand. In warmer weather vendor stands tend to spring up around the city offering this delicacy. If you appreciate sushi or at least pickled herring, give it a try! You can order herring in a bread roll and eat it like a sandwich. Though “the Amsterdam way” is to eat the herring cold, with only diced onions and pickles as garnish. It was delicious and one of my favorite must-have snacks on the trip. 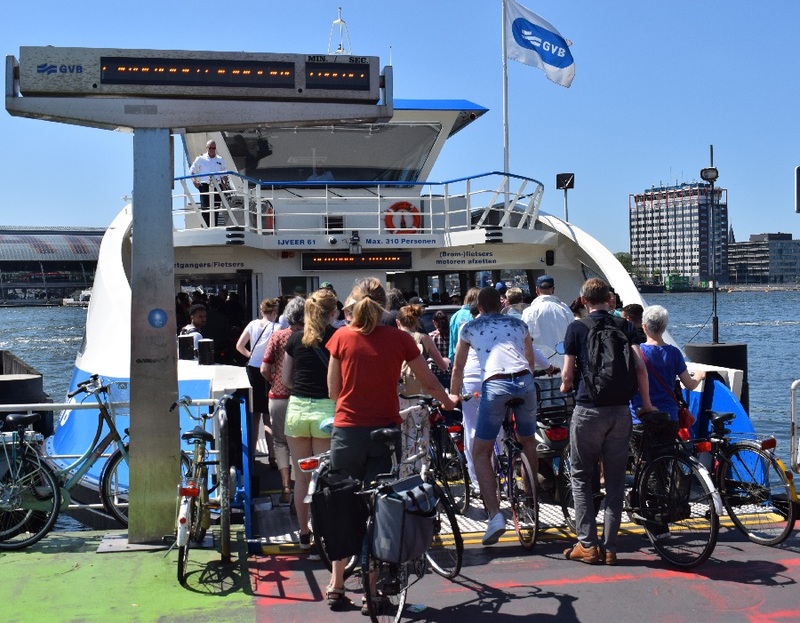 Now pointing my bike towards the Central Station, up through the city center at the river’s edge, I took a ferry across to the north side of Amsterdam. Following the designated bike route several kilometers, I found this part of the city was newer with many parks. After the Anne Frank tour, which was well worth the extra time of waiting in line, I was off to the east side of Amsterdam. This area, with several blocks of modern architecture, in between canals, gave me another perspective of the city. I planned to take in a few more tours, but I ended up spending more time on the bike. 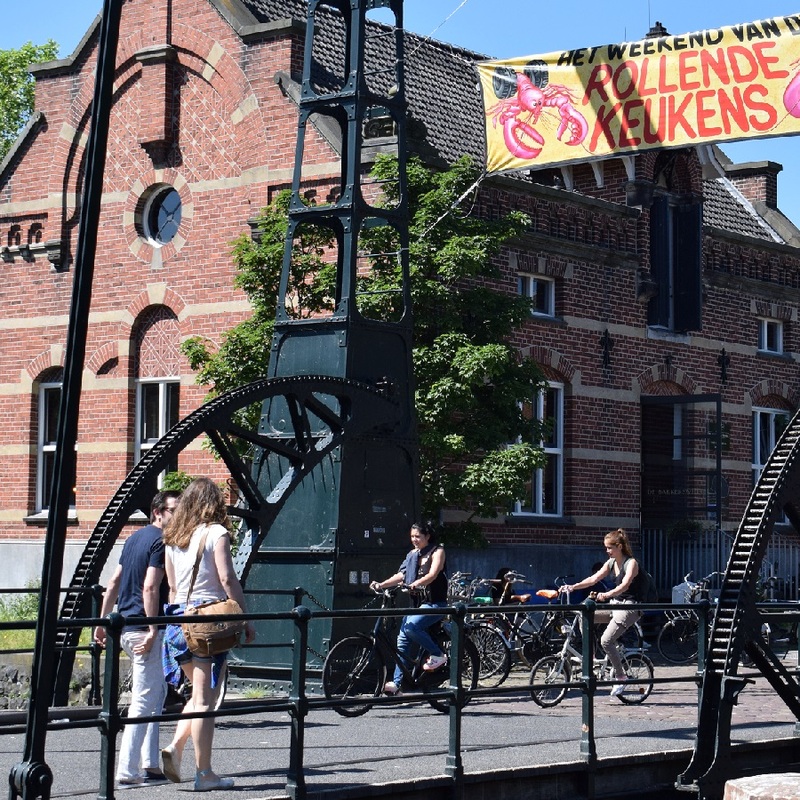 On my way back through the inner city of canals, as late afternoon turned into happy hour along the way, the activities along the sidewalk cafés were entertaining to see. bicyclists each day, why would you want to waste carbon fuel? ways before heading out into traffic and don’t be afraid to ring your bell! 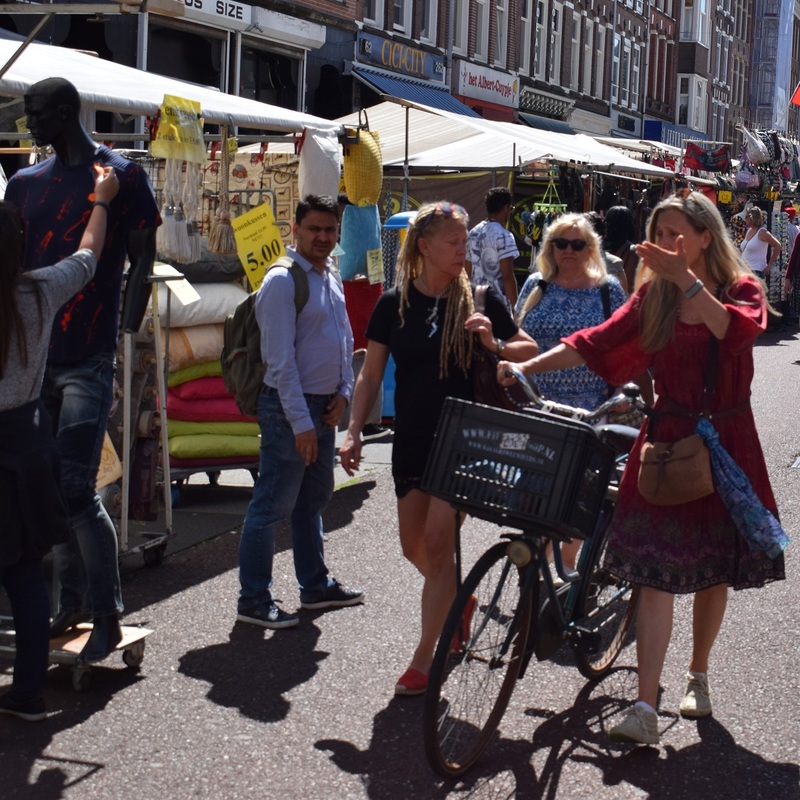 This entry was posted in Destinations, News and tagged Amsterdam’s flower market, Anne Frank House, architecture of the Rijksmuseum., bike Amsterdam, bike rental tip, charming flower boxes, Dutch treat, gorgeous architecture, herring stand, house of Rembrandt, navigating Amsterdam, Red Light District, tempting cafés and coffee shops on March 23, 2019 by Russ Lowthian.